Gregory Powers is a senior healthcare analyst at CHRT. He provides project management and analytical support for a variety of healthcare innovation and policy projects, including the Washtenaw Health Initiative and the mental health and public safety millage implementation for Washtenaw County. He also manages the Detroit Health Department Public Health Practice and Policy Engagement Fellowship. 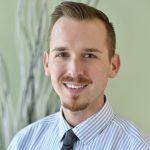 Prior to joining CHRT, Gregory worked in data and analytics for the care management department at Blue Cross Blue Shield of Michigan in Detroit. He has also previously worked for a cancer health services research group housed at the University of Michigan Medical School and on health policy and patient engagement projects at American Institutes for Research in Washington, D.C.
Gregory holds a master’s degree (MPH) in public health from the University of Michigan and a bachelor’s degree (BS) in journalism from West Virginia University.